Italian-American Recipes Just like grandma used to make! Bretta, Hi, nice to hear from you. Yes, there are not many people who know of this amazing soup by the particular name of Malenbon soup! Only a handful I have come across and in every case their family is from the Bari area in Italy. My grandparents on my mom’s side were both from Santeramo in Colle: Apulia Region (Puglia), 10 Miles south of Bari, Italy. Really does seem this recipe and particularly the name Malenbon soup was very local to the Bari area. Did you see the little historical note I added at the bottom of Melonbon Soup page. I did a lot of digging into the origin of this recipe. Very interesting. Turns out it seems it is an Italian twist on a German recipe. Very interesting! Anyway, this is one of my favorite recipes that my grandmother made. Every time I make it I go back to a simply time when I was a kid in my grandma’s kitchen with no worries. Thanks for sharing and I am glad you found the recipe. Keep on making it! It’s wonderful! Ciao, Anthony? Anthony, A couple of days ago, I made your spaghetti sauce, with pork chops, meatballs and Braciole, too. Wow, it was definitely the best sauce in the world! It was so good! My husband just loved it like crazy. When I was making the sauce, he smelled it once and he just couldn’t forget that lovely smell all day during his work. He even skipped his dinner and waited till I was off from work (almost 11:30pm) to make him the spaghetti. He said it was the best sauce he had ever tasted, even better than those eaten in 5-star hotels. I was so happy! Thank you dearly for your wonderful recipe and the way you’re putting it. It is the most detailed recipe I have ever seen. It was just like you’re here teaching me beside me. I have never made any spaghetti sauce before and this is my first time, and it was such a success! Everyone in my family loved it very very much. I must thank you again for sharing this recipe. Here are some photos for sharing. I love Italian food, especially spaghetti and Risotto. Now I have the best recipe for spaghetti, I should be glad if you would also share some good recipes for making Risotto. 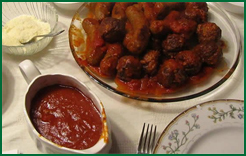 We’ll be eating your spaghetti sauce with pork chops, meatballs and Braciole for the rest of our life! Thank you so much indeed! ~ Best regards, Jo Ng. *You can see the photos that Jo sent in on the Visitors Photo Page. Anthony, Today my wife and mother-in-law made your Spaghetti Sauce, Meatballs & Braciole recipe including the pork chops. It was the best I have ever tasted. I love food and rate this as one of the absolute best things I have ever had. Kiss all your female relatives who taught you this and drink a glass or two of wine for me. I can’t wait till this stuff is frozen and actually gets better!!!!! That would almost make it sinful. 🙂 Now I need to go take a nap cause my belly’s so full and happy. They cooked and listened to Italian music all day. They said the music definitely helped!!!! Sincerely, Jonathan & Jill and Taze & Connie p.s. My wife wonders if you buy your beef for the Braciole already tenderized so that it’s thin enough to wrap? She said her’s seemed thicker than the pictures online. Also do you buy seven round steaks or is it just one cut and pounded into seven strips? Hey! 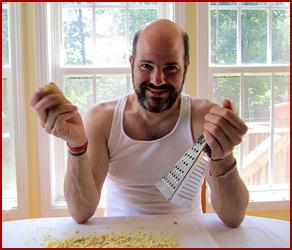 I just wanted to send you a quick note to thank you for your Spaghetti Sauce recipe! It was truly amazing! The directions were superb and my sauce turned out awesome the first time. I was looking around the web for some ideas for sauce cause spaghetti is my favorite. I found a bunch of small ones that I was going to try instead of yours, but I figured the ‘big’ one would probably be the best so I put in the time and effort and boy was I rewarded. Kudos to you and thanks again. ~ Trevor, Vancouver B. – PS: What type of consistency am I ultimately looking for? The sauce thickened quite nicely after sitting for a day, but I just wanted to be sure, cause it’s not as thick as store bought stuff and I was wondering if it turned out correct. No worries though – it’s still the best sauce I’ve ever had!… Damn! I forgot to comment on the meatballs! They were sooooo good and the chops! Like none I have ever had before! I will be making this weekly until I die! Thanx spaghetti man! Laura, First of all let me say, I’m glad to see all my hard work of laying out this recipe in fine detail being put to good use. I love to hear from people who are actually following the recipe. It is so designed that if you follow it carefully you will come out with a wonderful spaghetti sauce Every time! :)) I originally put this sauce page up on the web for my Dad who Always wanted to make his mother-in-laws (my grandma) sauce, but he can’t cook a thing!.. So on day when I was cooking the sauce like I always do I decided to write down every single step.. witch turned out to be a LOT more work than I thought, but I finally got it all spelled out for my dad in a way that was easy enough for him to follow. He read the recipe and got it right on the first try! A man that could not cook a thing cooking a wonderful Sunday afternoon spaghetti sauce.. Amazing! 1.) Can I use my garden fresh tomatoes in the sauce? Yes you can, but I would not make the whole sauce from the tomatoes. You could ad 1 or 2 tomatoes to the sauce to get a fresher taste to it. If you are going to add the tomatoes do the following. You will first need to blanch the tomatoes. Boil some water and then drop in 1 or 2 tomatoes in the boiling water and let sit for about 5 seconds then quickly take them back out of the water, let cool for a minute and then peal off the skin. Cut the tomatoes in quarters and remove all the seeds. (seeds make the sauce bitter, you don’t want to add any seeds to your sauce). Then dice up the tomatoes and add them to your sauce early on in the cooking process so they get a chance to cook down a bit. 2.) How do I store the sauce that I don’t eat? Happy Cooking, Happy Times, Share The Love! 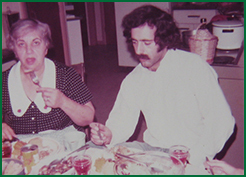 For all of you wonderful people who miss your Italian grandmother’s cooking and for those that wish they had Italian grandmothers. These recipes are for you! Go ahead, cook all day, sit at the table and eat! Share laughter and love in the kitchen and at the table! Mangia! Why did I make this website? Check out the About page for all the details. Anthony’s Italian Recipes Facebook Page! join the conversation! This is a special section of the website where I share some of my favorite conversations with site visitors. Let's talk about some Italian food and family! The Sunday Gravy (or pasta sauce if you want to call it that) with all the meats! All the details on how to make this amazing meal! Lasagna! Learn how to cook it like grandma did! Chicken Cutlets! My very favorite! 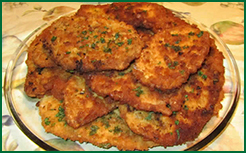 Learn the secrets of how cook the cutlets like grandma did! Anisette Cookies! These are my favorite Christmas cookies of all time. It's not Christmas time until we make these special treats! You have got to try these out! Easy to make! 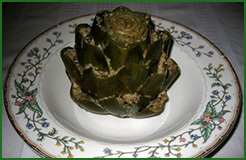 These stuffed artichokes are a special treat! They even require a little lesson on how to acually eat them. Learn how to make these like grandma did. 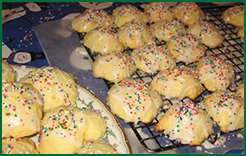 These are amazing Italian cookies! 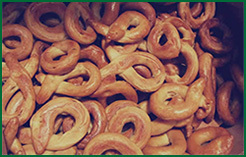 They are called Taralli, pronounced (Ta-Dolls). They are really an Italian pretzel. What makes these special is the texture and the fennel seeds! I used to teeth on these when I was a baby! Learn how to make them like hey did in the old days!. OK, I have the semolina pasta ready for the Chicken Soup (Melonbon Soup). Let's eat! 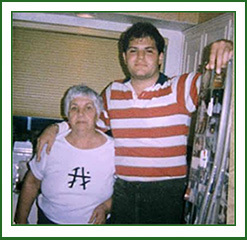 All about Grandma Salerno The photo above is me at 20 with my grandma Salerno. She is why I created this entire website. It's really a tribute to her cooking and the love she poured into the cooking for the ones she loved!